Motorcycle Rack Truck & Car Racks from Proline: Thule Racks, Yakima Ski Racks, Bike Racks Canoe and Kayak Racks Cargo Carriers and Truck accessories. VersaHaul VH-50CC Scooter - Moped Hitch Carrier hitch mounted carrier rack. VersaHaul VH-55 Motorcycle Hitch Carrier hitch mounted carrier rack. 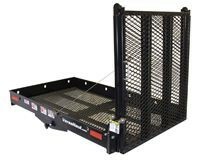 VersaHaul VH-55RO Motorcycle Hitch Carrier rack with loading ramp. VersaHaul VH-90 ATV hitch mounted carrier rack. VersaHaul VH-MS Mobility Scooter and Wheelchair Hitch Carrier hitch mounted carrier rack.